Be Green offers landscaping services focused on the meeting of form and function, including landscape lighting, landscape design and full-service installation. As an insured and bonded landscaper, we're known to our customers as a landscaper with a friendly demeanor, fair pricing and excellent attention to detail. Be Green performs landscape lighting and design services in Austin, Round Rock, Georgetown, Cedar Park, and surrounding communities. Call or complete this easy request through the website to receive a free estimate on landscape design and landscape lighting services. A landscaper that digs hands-on service. Whether a seasonal planting service or installation of a new landscape lighting design, you're likely to see John, Be Green owner and lead landscaper, on your property during installation, supervising your landscaping crew and even getting his hands a little dirty. It's a sign to many customers that he takes pride in his work, enjoys working hard and expects the same professional, honest attitude of the staff here at Be Green. 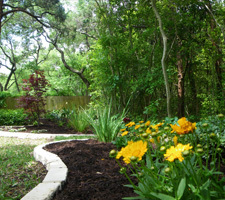 "They gave a good evaluation and proposal beyond any other landscape company. They owner was out there working with his crew the entire time. He did not drop them off and leave, but actually got into the manual labor and directed the project. The final outcome was excellent. The French drain was expertly done, and the lawn surveyed and leveled. I would strongly recommend their services." John F. - Cedar Park, TX. Serving Austin and surrounding areas, including Round Rock, Georgetown, & Cedar Park, Texas.